The strong partnership between the University of Ulster and local schools was highlighted when dozens of pupils received their parchments at the annual Step-Up graduation ceremonies. In the north west 68 pupils from St Cecilia’s College, St Mary’s College, St Joseph’s Boys School, St Brigid’s College and Lisneal College successfully completed the Step-Up programme, obtaining vocational A-Levels in Science subjects, which will help them to progress to university. 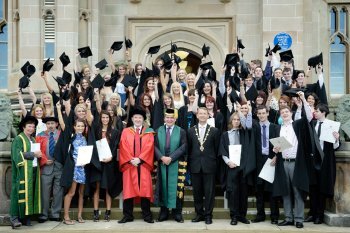 The graduation ceremonies were held at the Magee and Jordanstown campuses last week. Step-Up - which has been identified within the Higher Education sector by Universities UK as “an outstanding example of the best practice in the provision of educational opportunity” - is an innovative science-based programme aimed at helping pupils who would not have traditionally considered going to university a better chance of securing a place at higher education institutions. The programme involves the University, schools, industrial companies, local hospitals and government agencies working in partnership to deliver an Applied GCE Science qualification within a highly structured programme of academic and vocational activities. It was launched by the University of Ulster in the North West in 2000, and proved so successful that in 2006 its remit was extended to enable it to work with 15 of the most disadvantaged schools in the Greater Belfast area. Since its inception, 721 students in the north west and 551 from Greater Belfast have participated in the programme with 99.8% obtaining the GCE Applied Science qualification. 72% of students have obtained double 'A' or 'B' grades, with 91% of students achieving ‘A’-‘C’ grades. During 2002-2010, 27% of students have achieved straight 'A' grades. Of the students who successfully completed the Step-Up programme, an amazing 97% have progressed to universities in the UK and Republic of Ireland. Dr Damian O’Kane, Head of Access and Educational Partnerships and Director of Step-Up, said: “Step-up clearly demonstrates what can be achieved when universities in partnership with schools and industry are encouraged to strengthen and enrich the secondary school curriculum and actively engage students in academic work that they perceive as meaningful and motivating. Caption: Students from St Cecilia’s College, St Mary’s College, St Joseph’s Boys School, St Brigid’s College and Lisneal College who successfully completed the Step Up programme with the University of Ulster celebrate their graduation with Professor Anne Moran Pro-Vice-Chancellor (Educational Partnerships & International Affairs, Dr Max O’Brien, chair, Convocation Committee, Dr Damien O’Kane, Head of Access and Educational Partnerships and Professor Richard Barnett, Vice Chancellor of the University of Ulster.